Tim Laskey, President of Wyman Piano Company, announced six new vertical piano models and four new grand piano sizes. Its vertical piano lineup now includes 42.5", 43", 45", 46", 48", and 52" sizes. George Benson, Wyman national sales manager, said, "These additions to our popular vertical lineup have already proven to be a success with our dealers. We now have three-true institutional models: the WV110 Classic 43" institution style piano is available in classic polished ebony, cherry, and mahogany, the WV118 Institutional 46" model features a full-length music desk, locking keycover and top lid available in polished ebony and satin cherry, and the WV132 52" Studio Grand Piano available in polished ebony completes the Wyman vertical piano line. "We've also added the WG185-6'1" grand piano," Laskey said. "With this addition to our great selling grand lineup, 4'9", 5'3", 5'7", and now a 6'1". 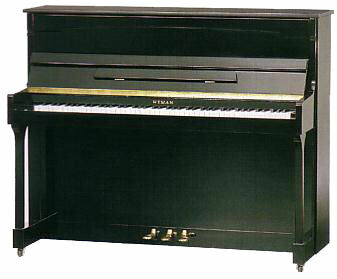 Wyman grand pianos are available in polished and satin finishes with spaded straight, empire, and French styled legs, music shelf, and pedal assemblies. Wyman Piano also distributes the Otto Altenburg grand pianos available in 5'" and 5'7" sizes. These grands feature individually tied stringing just like high-end European grand pianos but at a first-time buyer's price.